The Singapore Botanic Gardens (Chinese: 新加坡植物园; Malay: Taman Botanik Singapura or Kebun Botani Singapura) is a 74-hectare (183-acre) botanical garden in Singapore. It is half the size of the Royal Botanic Gardens in Kew or around one-fifth the size of Central Park in New York. It is the only botanic garden in the world that opens from 5 a.m. to 12 midnight every single day of the year, and does not charge an admission fee, except for the National Orchid Garden. The garden is bordered by Holland Road and Napier Road to the south, Cluny Road to the east, Tyersall Avenue and Cluny Park Road to the west and Bukit Timah Road to the North. The linear distance between the northern and southern ends is around 2.5 km (1.6 mi). The first "Botanical and Experimental Garden" in Singapore was established in 1822 on Government Hill at Fort Canning by Sir Stamford Raffles, the founder of modern Singapore and a keen naturalist. The Garden's main task was to evaluate for cultivation crops which were of potential economic importance, including those yielding fruits, vegetables, spices and other raw materials. This first Garden closed in 1829. 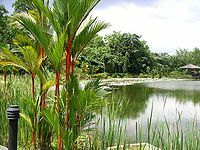 It was not until 30 years later that the present Singapore Botanic Gardens began in 1859, when the Agri Horticultural Society was granted 32 hectares of land in Tanglin by the colonial government, which had obtained it from the merchant Hoo Ah Kay, known as Whampoa, in exchange for land at Boat Quay. Laurence Niven was hired as superintendent and landscape designer to turn what were essentially overgrown plantations and a tangle of virgin rainforest into a public park. The layout of the Gardens as it is today is largely based on Niven's design. The Agri Horticultural Society, however, ran out of funds and, in 1874, the colonial government took over the management of the Gardens. 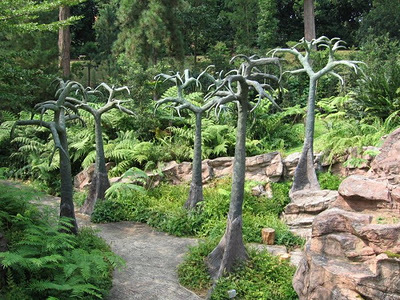 The first rubber seedlings came to the gardens from Kew in 1877. A naturalist, Henry Nicholas Ridley, or Mad Ridley as he was known, became director of the gardens in 1888 and spearheaded rubber cultivation. Successful in his experiments with rubber planting, Ridley convinced planters across Malaya to adopt his methods. The results were astounding; Malaya became the world's number one producer and exporter of natural rubber. Another achievement was the pioneering of orchid hybridisation by Professor Eric Holttum, director of the Gardens from 1925 to 1949. 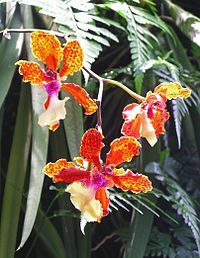 His techniques led to Singapore being one of the world's top centres of commercial orchid growing. Today it also has the largest collection of tropical plant specimens. During the Japanese occupation of Singapore from 1942 to 1945, Hidezo Tanakadate (田中館秀三), a professor of geology from Tohoku Imperial University, took over control of the Singapore Botanic Gardens and the Raffles Museum. At the beginning of the occupation, he ensured that no looting occurred in the Gardens and the Museum. Both institutions continued to function as scientific institutions. Holttum and Edred John Henry Corner were interned in the Gardens and instructed to continue their horticultural work. The Gardens was also renamed as Shōnan Botanic Gardens (昭南植物園). Later that year, Dr. Kwan Koriba (郡場寛), a retired professor of botany from the Imperial University of Tokyo, arrived as Director of the Gardens, a post he held until the end of the war. After the war, the Gardens was handed back to the control of the British. Murray Ross Henderson, curator of the Herbarium before the war, succeeded Holttum as director from 1949 to 1954. Eventually the Gardens played an important role during the "greening Singapore" campaign and Garden City campaign during the early independence years.